It is fun taking care of a child, never had 2 or 3 at once though. I took off from work when Debbie went back to work and took care of the baby. Caught hell at work but it was the law so too bad but it was worth it. It was nice to get a day off as it takes a lot of effort if you take care of kids the right way. What a wonderful way to celebrate the first day of school for the twins. They look excited about heading back to school. Good way to spend your firt day of freedom!! They look so cool for their first day of school! That's so sweet that they wanted to see their friends. Glad you are able to enjoy some down time while everyone is in school--it's well deserved!! OMG.. what a great, cute photo of the guys. 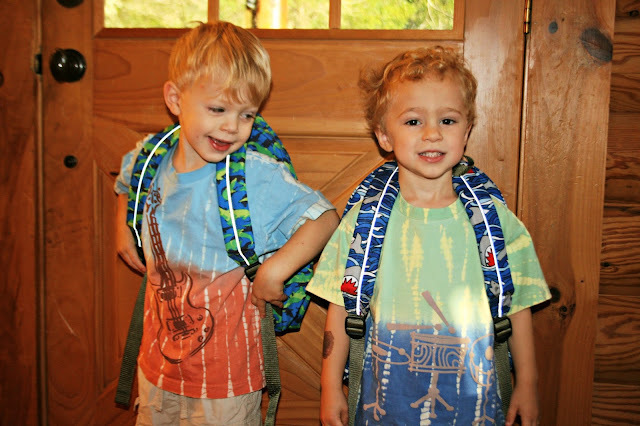 They look awesome and happy to be headed off to pre-school... we still need to get together! It is awesome you took a little time for your self. As mothers we often forget to renew our batteries. I bet they were very happy to see their friends. I know my grandson was thrilled. Happy for the twins and for you. :). Good for you, Lisa, to get in some relaxation! Sounds like you spent a perfect first day school doing stuff for YOU! I know I am always the old doomsayer but aren't you taking a risk by running off by yourself like that. Twice in the last four years we've had women disappear doing that very thing. Isn't there anyone who could run with you? Safety in numbers type of thing. How cute are they! Good for you....taking time for ourselves is so needed. It sounds like a perfect day, and now finally you can have some time just for yourself! The twins look so cute, I this picture, I cannot believe how much they are growing!! That's great that you get some time without them. They look happy in the photo. Good for you, nothing better than taking some well earned time for yourself. Glad the boys are loving their preschool. Freedom! For a little while anyway. Glad you all enjoyed the first day of preschool. They look so cute! and sounds as if you made a great day of it! Enjoy!!!! And they are sooo adorables! Thank you for the well wishes for me while I recoop from my back surgerys. My Axle tried the whole Preschool thing and he only lasted a day. While I love having him home, I have to admit that I was looking forward to some downtime myself! They are soooo cute!!! Glad they are enjoying school! Agreed with you, Lisa. It's good for all of us to have down time and to savor the moment! Hope they enjoyed school, glad you took it easy on your first day off too!! adorable - hope they have a great year! They are adorable! I hope it's going well so far!